Just a reminder that tomorrow is the last day of the Cyber Monday sale in my Etsy shop! 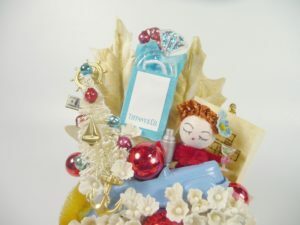 Every corsage and tea cup gift set is marked down 20%. Use coupon code BLOG10 at checkout and get an additional 10% off! It’s a great opportunity to get some great bargains on unique handmade gifts for all the ladies on your shopping list. Every corsage is one-of-a-kind and can’t be duplicated – so don’t miss this opportunity to pick up your favorites at these great sale prices. Just a quick note to remind everyone that I have a sale in my Etsy Shop that runs from Black Friday (11/23) through Cyber Monday (11/26). Everything will be marked 20% off, including all clearance items. If you use coupon code BLOG10 when you check out – you’ll get 30% off! Sale prices will only be good for these 4 days – so make sure you stop by the shop and pick up your favorite corsage and tea cup set while the selection is good. I am listing a few more items this week – including the adorable SANTA BABY corsage pictured here. I had to make a corsage inspired by my favorite Christmas song! Best wishes to you and your family for a very Happy Thanksgiving! 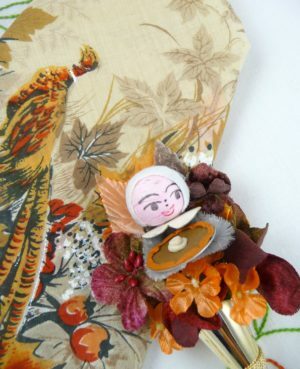 Giving Thanks with Vintage Corsages! The air is getting crisp and the nights are chilly! It’s a special time of year here in Southern Appalachia and nature is turning out in a spectacular display. Vibrant hues of rust, orange, golden yellow, and sienna brown are splashed across the mountains. The sunlight is mellow and it is hard to stay indoors during these special days. As I watch the leaves gently fluttering down, I give thanks for having the good fortune to live on such a lovely landscape. I interpret this special time of year in my corsages by using rich velvet millinery flowers and leaves in those same gorgeous colors. In this corsage, I’ve added a vintage spun cotton pilgrim couple. They are proud of their feast of roasted turkey and pumpkin pie. Look closely near the top and you’ll find a miniature bottle of wine tucked in too! 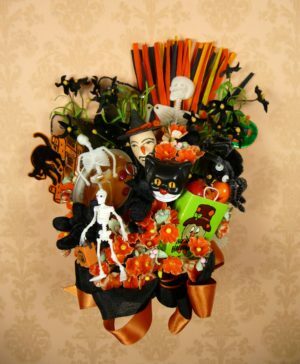 These look great in centerpieces, wreaths, and displayed leaning against small easels on a mantle or tabletop. 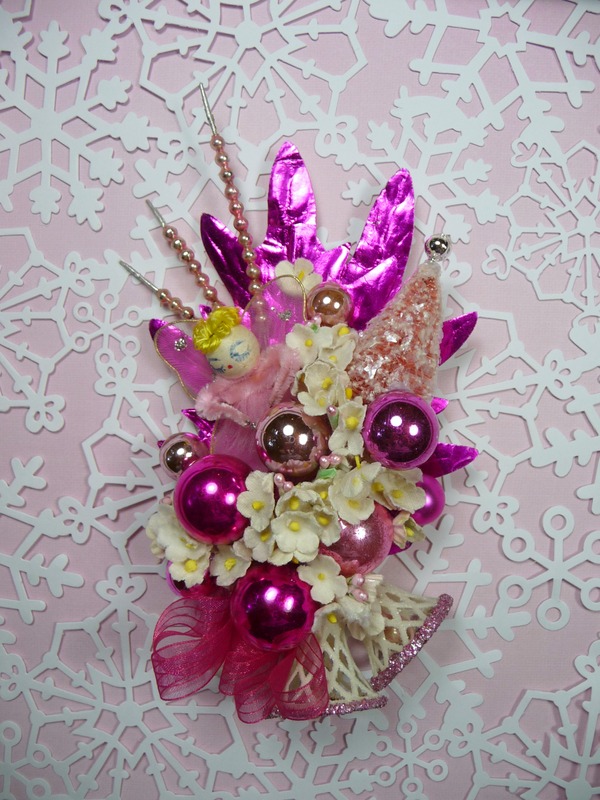 Of course, all the corsages I make can also be worn! 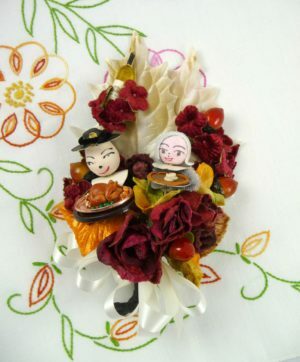 In addition to corsages, I’ve also paired a tussie mussie pin featuring a Pumpkin Pie Pilgrim with a vintage hankie. I love this hankie – it has a great Fall scene with leaves and a pheasant. The bar pin on the tussie mussie makes it easy to affix to your lapel – or your favorite cook’s apron! What a great hostess gift! I wish you all a wonderful Thanksgiving holiday. I hope you share fun and peace with family and friends – and that your travels are safe. I appreciate all my customers, and I am very grateful for your patronage. 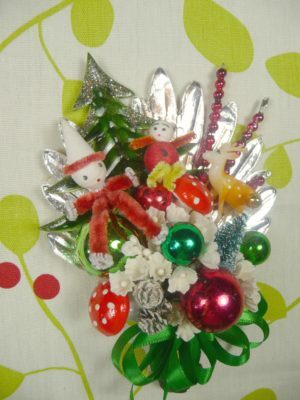 I invite you to stop by the shop and check out all my holiday corsages. 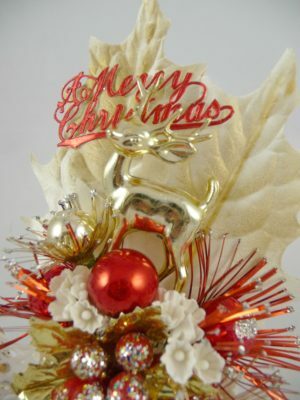 There is a great selection of holiday items, and I am adding more frequently. Also, check out my new CLEARANCE SECTION where you’ll find items that are marked down 50%. Take advantage of my end-of-the-year specials and pick up some great bargains. As always, use coupon code BLOG10 when you check out and get an extra 10% off everything in the shop – including clearance items! Check back here often as I’ll be updating my blog throughout the holidays! Believe it or not, my Etsy shop stocked up with all my corsages made with vintage findings and millinery flowers will be 2 YEARS OLD this week. It is hard to believe that two years have gone by so quickly! I have made many new friends and my corsages are being worn and displayed all over the world – and that makes me feel very happy. In honor of these two happy years, I have all my Halloween items on sale, so now would be a great time to stop by and pick up some bargains! Many thanks to all my wonderful customers! I appreciate you all very much! Your support means the world to me! Summer is finally winding down here in North Carolina. Fall is trying to sneak up on us… Every once in a while, I can feel a cool wisp of wind sweep down the mountain, and the air is getting that dry touch that signals the turn of seasons here in Appalachia. I have been busy the last couple of months getting inventory ready for the shop – I’ve already posted some really cute Halloween and Thanksgiving corsages, and I am posting Christmas corsages every day, so stop by and pick out some vintage corsage goodness for the upcoming holidays! I always love to hear from you, so stop by and say Hello. I truly appreciate my customers, and I would like to start posting some photos of all you wonderful ladies who are wearing my creations AROUND THE WORLD! Especially all the brides with their bridesmaids enjoying my vintage tea cup sets and future Moms at baby showers! If you have a photo you’d like to share on this blog, let me know and I’ll tuck in a special gift in your next order as a thank you! 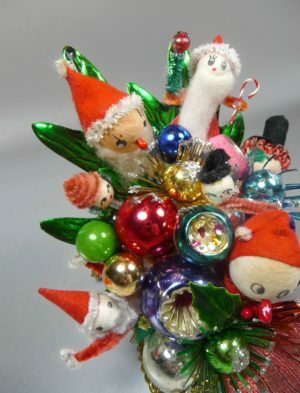 Last Chance for Christmas in July Savings on Vintage Corsages, Teacups, and Tussie Mussies – and a Special Bonus for Readers of my Blog! Just a reminder that my biggest sale of the year – CHRISTMAS IN JULY – will be ending soon! 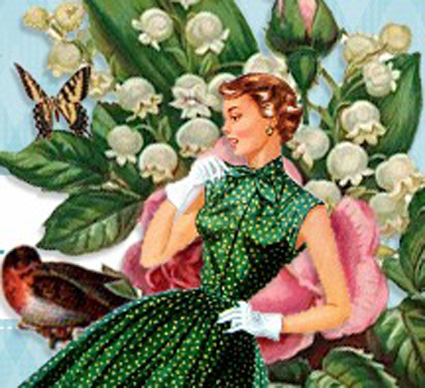 Every vintage corsage, tussie mussie, teacup set, and hankie is discounted 20% through July 28. There will never be a better time to stop by the shop and get an outstanding deal on all your favorites. As a reader of my blog – here’s a special tip… type in coupon code BLOG10 at check out and get an ADDITIONAL 10% off! That’s 30% off the regular price of every item in the shop – but don’t wait! Christmas in July ends soon! Just click on “visit store” at the top of this page and check it out! 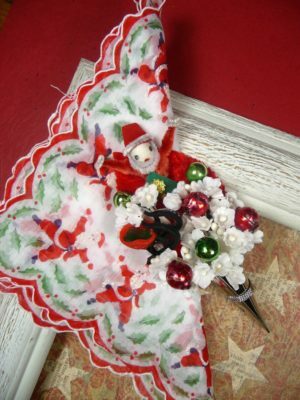 Vintage Corsages, Teacups, Hankies, and Tussie Mussies are all 20% off at my Christmas in July Sale Going on Now!!! Happy July everyone! Can you believe that 2012 is half over?!!! It’s 104 degrees outside – but we’re celebrating Christmas in July right now in the shop – with a great sale on every vintage corsage, hankie, tea cup set, and tussie mussie! Just wanted to send out this reminder about the Christmas in July Sale that is running now through July 29 in my Etsy shop. 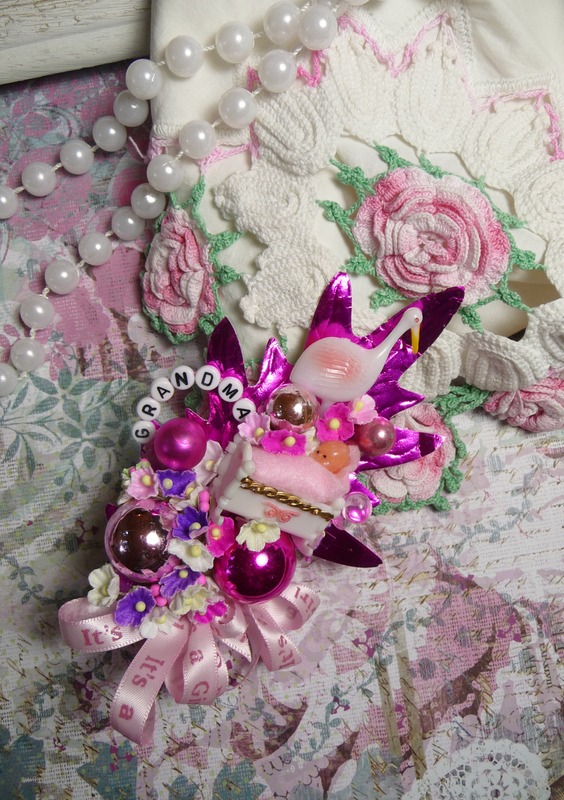 I have posted a lot of new corsages and tea cup sets, and the prices have been slashed 20%. That is the deepest store-wide price cut of the year, so there won’t be a better time to pick out some true bargains. Sale prices are already posted on each item, so you do not need to enter a coupon code when you check out. And remember, this sale is NOT just for Christmas items.. Every tea cup set, every vintage hankie set, every corsage, and every yard of fabric is marked down 20%. 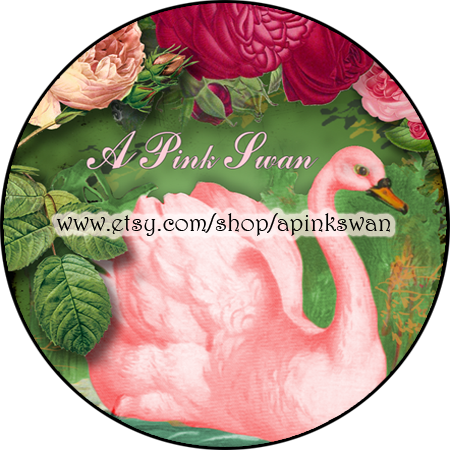 You can just click on the VISIT STORE link at the top of this page to go straight to the shop. 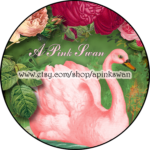 If you are interested in getting notifications of future sales events and discount coupon codes, you can subscribe to the blog by typing in your email address in the bar on the left. When new info is posted on the blog, you’ll get an email that shows you the content. Have a great summer, stay cool, and celebrate Christmas in July with a visit to the shop! My Christmas in July Sale will run July 1 -30, but readers of my blog and Facebook page can shop early in my “secret” sale just for them! Use coupon code SUMMERSANTA20 at check out from June 23 – June 30 and get 20% off every item in the shop! Christmas in July is my biggest sale of the year, so don’t miss this chance to shop early and pick up some great bargains before the mark downs are offered to everyone. I will be traveling July 13 – 25, but the shop will remain open. Items purchased during those dates will ship when I return home. Thanks so much for your patience while I take that time off to spend with family. I hope you are enjoying the summer with friends and family. As always, I appreciate your interest in my vintage corsages, hankies, and tea cups. When most people think of holiday corsages, they focus on Christmas, but the vintage theme can celebrate any number of holidays. Are you a fan of vintage Halloween antiques and collectibles? If so, have I got a corsage for you! 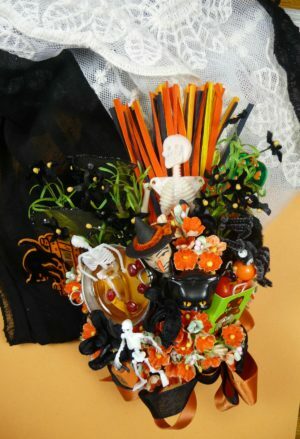 This is a terrific corsage that incorporates vintage Halloween miniatures – including a skeleton who fell into the tub of bobbing apples! The back has a vintage noisemaker, and a vintage chenille spider is also creeping around. 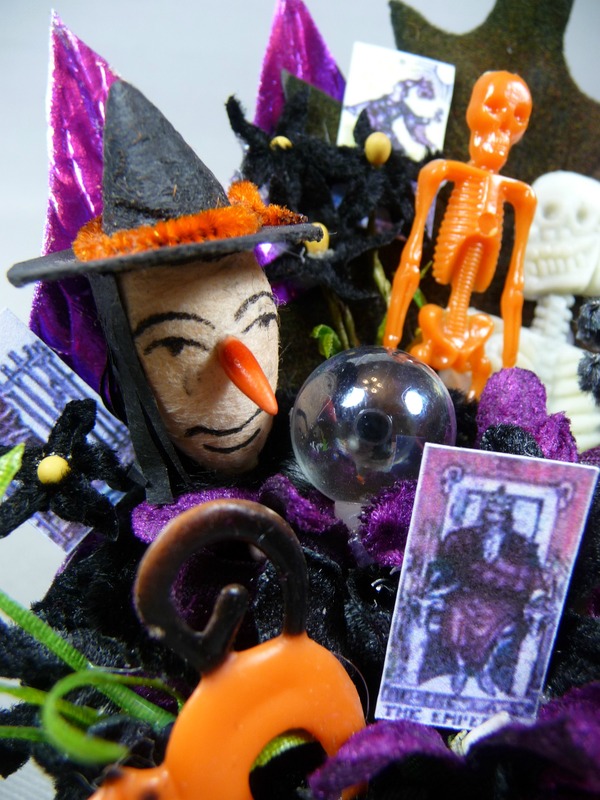 Another fun corsage features a vintage spun cotton witch who is gazing into her crystal ball. Tarot cards are scattered about, and a number of vintage picks are tucked in too. 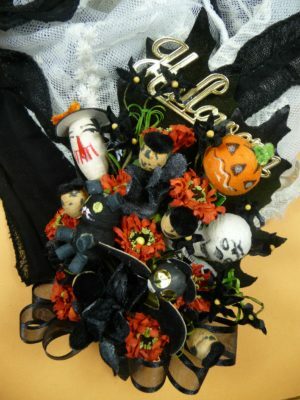 Each Halloween corsage in the shop is different, and the themes range from festive to downright creepy! 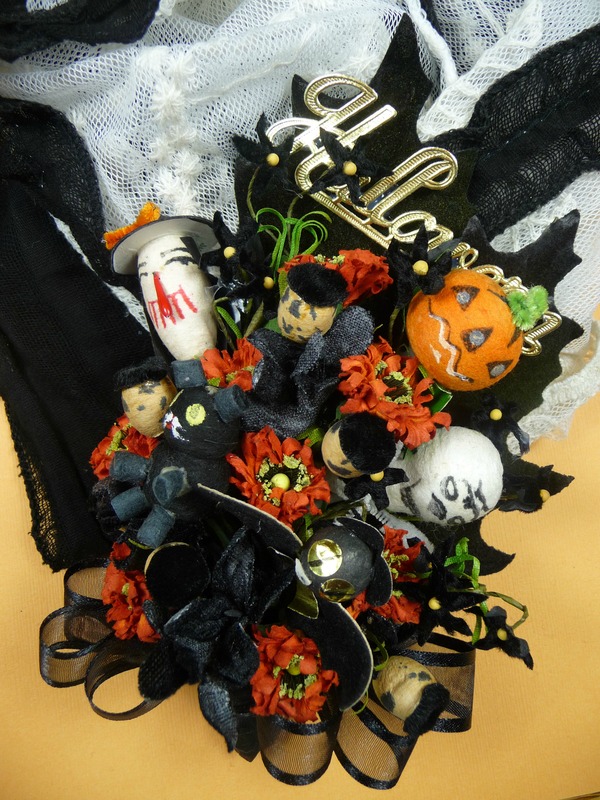 Collectors of vintage spun cotton heads will love this corsage that features quite an array. There is a witch, a skull, a jack-o-lantern, a black cat, and even a bat with a spun cotton head! You know, my Christmas in July Sale is not just for Christmas! The sale takes place July 1-30, but readers of my blog can use coupon code SUMMERSANTA20 from June 23 – 30 and get 20% off their entire purchase – before anyone else! 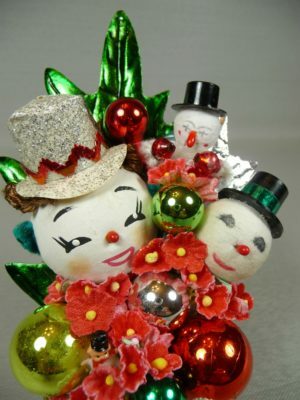 Stop by the shop and see vintage corsages for holidays all year! Celebrate an Early Christmas in July with a Vintage Corsage! My annual Christmas in July Sale is right around the corner! All purchases in my shop including vintage corsages, tea cup gift sets and fabric will automatically receive 20% off July 1- 30. If you’d like to make your purchases before the Christmas in July sale is open to everyone, just use coupon code SUMMERSANTA20 at check out any time between Saturday, June 23 and Saturday, June 30 – and you’ll get 20% off on every item purchased then as well. This is not a sale that will be announced at the shop – but a special sale just for you! Stop by the shop early and pick out your favorites before someone else does! I am adding new items every day, so shop early to get the best selection. Remember – Christmas in July is my biggest sale of the year, so there will never be a better time to do a little early holiday shopping for loved ones – or yourself! Thanks for your interest in my one-of-a kind corsages made with vintage party favors, millinery treasures, and unexpected whimsies. Corsages have been treasured for centuries by women who express their personality by wearing a corsage that is designed to show their passions, interests, and emotions. Once worn on a woman’s waist, corsages since then have crept up the torso and are now worn almost exclusively on the left side of a woman’s chest – just over her heart.